One of the most asked questions for this time of year at the Nursery is, “what to do with the roses?” After the summer heat, fall’s cool down can produce some of the years best blooms. Do you feed? Do you prune? Should you continue to spray for insects and disease? No, to all of the above: most experts let them rest. 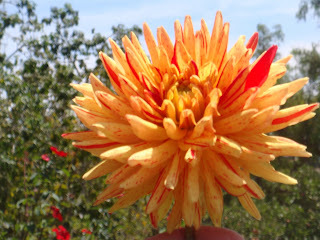 If you must, you may pick or dead head the flowers before Thanksgiving but that is about it until January. With the cooler temperatures, the roses feel like it is spring again. They love the cool nights and sunny days. You can still get a last great bloom for Thanksgiving. But do not feed! You don’t want to encourage new growth as we go into winter with shorter days and colder temperatures. The buds and flowers would be ruined by the moisture and dampness in our coastal air. You want them to slow down and rest. To conserve their energy for next springs big show. By allowing the roses to “bloom out” and develop “rose hips”, it sends a signal to the bush to slow down. It will stop putting out new growth and forces it into dormancy. It has been working all summer and needs some time off, just like us. You can keep the bush clean from yellowing leaves if you must, but it is going to look a bit raggedy anyway. It’s just that time of year. Very important, is to not forget the regular watering. Even though they are slowing down, their need for water goes on thru winter. So now, for the most part, you can take some time off from the demanding summer rose care until January. At that time you will have to jump back into “rose maintenance”, with the hard pruning and dormant spraying for insects and disease. But that is a whole other subject. So until then, enjoy the rose season’s last and possibly, “best blooms”, of the year. And don’t forget to check our website for the 2009 Bareroot rose list. It is never too late to find a new place to squeeze in a new rose. Many trees do not like to be planted in lawns. They perform best with deep infrequent water rather than the shallow frequent water we put on our lawns. We often see problems with lawn planted citrus in particular. Here is a list I’ve started. If you have any suggestions email me at nursery@lasumida.com. They have over 6000 photos of over 1000 trees. You can also search for trees by many attributes. Some of these include: climate zone, soil type, size, utilities, root damage, growth rate, disease and pest resistance, fire danger, flower color, etc. etc. etc. I always advise customers looking at trees to “do the research’ and this website makes it easy. With fall comes the transition of the summer garden into winter color. Hard to think about sometimes when the days are still nice and warm. This can be a confusing timing issue. After the warm August and September days, while most of the garden is still showing color, it can be a little tired and overgrown. Even the garden at the front of the nursery shows the “end of summer” stress. So this is the time to re-look at the garden. See what needs to be cut back or taken out. I know that it can be hard to prune back plants when they are still trying to perform, but it is better to do the trimming now, so they have time to re-grow before the cooler winter nights slow them down and they don’t have time to put out new growth. You can also take this time to decide on what needs to be taken out or relocated. We all have planted and then realized that it was the wrong choice or didn’t perform the way we may have envisioned. My gardens are never static. I am always learning and changing. Plants I thought would look good and fit nicely into my landscape, end up getting to big, out of control, or just don’t look like what I wanted. So I usually dig it up, pull it out or move it and swear that I am going to simplify my garden and make my life easier next year. Fall is a great time to think about changing your garden. It is still warm enough for new plantings to root in. And there is still a good selection of perennials available at the nursery. Also the colorful, winter annuals and cool season veggies have arrived. Also, our Fall planted bulbs have arrived. Plant now for Spring color. We receive more questions, and see more problems, in the nursery related to watering, than perhaps any other subject. 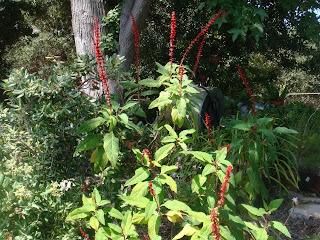 In the 4/26/08 Blog I discussed water for landscape plants. This week I’ll address outdoor container plants. How do we water all the plants in the Nursery? Embarrassingly it’s not just our customers who have problems. We do too. Sometimes we see over watering and sometimes under watering. It’s the hardest thing for us to train our new employees. First of all you need to know how much water individual or groups of plants perform best with. Classes of plants have differing water requirements. For example: our ferns will need water more often than our camellias. Hanging baskets and small containers need watering way more frequently than a 15-gallon tree. To further complicate matters, some growers use light fast draining potting mixes, while others use heavier water holding mixes. We could have the same Blue Salvia in the same size pot, from two different growers, and one will be dry, and one wet, even though they were last watered at the same time. We train: “always water a dry plant, do not water a wet plant”. We teach to look for signs: drooping foliage, learn how heavy the container feels when it is wet, and how heavy when it is dry. Look at the bottom holes of nursery containers: are they moist or dry? Stick your finger in the pot: is the soil dry down two inches? The next thing we have to train is how to water. We have to watch new people to make sure they are not blasting the soil out of the container. On flowers and small bedding plants etc. I like to use a water wand. The water-wand disperses the water and helps to not bruise the flowers. We train to water early in the day whenever possible so the plants “don’t go to bed wet”. I hope this look into our problems helps you with some of your watering questions. Thanks for the opportunity to clarify my thoughts; there will be more on this subject in the future. It is hard to believe that I once did not care for the color orange. Walking through the garden this August I marvel at how are tastes change over the years, and what a warm, marvelous, diverse color orange is. We sometimes complain about how “blah” the garden is in late summer, but my orange flowers are giving it a lot of punch. These aren’t even all the pictures I took. I was playing with a macro lens and don’t quite have the hang of it yet so many more “orange” flowered plants didn’t make the cut. 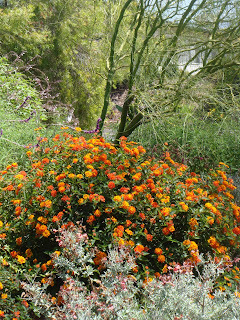 Pictured are: Cape Honeysuckle, Gaillardia ‘Oranges and Lemons’, Salvia confertifolia, Cigar Plant, Alstroemeria, Dahlia, and Lantana. Remember to give most of your plants a nice long deep soak this month. What a busy couple of weeks it has been. My fruit trees all came ripe at the same time: apricots, peaches and nectarines. Biggest crops I have ever had. And for once, we got them covered with netting before the birds discovered them. Why such a great harvest this year? We had cool winter, a good amount of rain and a perfect spring? I did give them more water this year than I have in the past. Was it all the work we did pruning, spraying and feeding? Or was it just that the moon and stars were all lined up right? Who knows? All I know is that I had a ton of jam to make and there seemed to be a shortage of half pint canning jars in town. Not only that, but pectin was in short supply and very expensive this year. You would think that that the stores would stock up at this time of year. You try so hard to do everything right to get a good crop and then when the magic happens, you can’t find the supplies that you need to make the fruits of your labor come to fruition. Lesson learned…BUY YOUR CANNING SUPPLIES EARLY!!! or the jams, pies, crisps and tons of fresh fruit. Yes, it was a bumper year. So now that I have a years worth of jam in the pantry and my Christmas gifts are set and ready, I can relax and not worry about my fruit trees until it is time to prune and spray again in January. The birds can have whatever I have left behind (it’s always nice to share). Now my big worry is how do I keep my tomatoes healthy and producing while I go up to Idaho for the month of August on my much needed vacation? Prime producing time for the summer vegetable garden, and I am going to miss it. There will be no one to reap the bounties of all my tomatoes, squash, cucumbers, eggplants and peppers as they reach their moment of productive glory. Can I trust anyone to really care for my garden while I am gone? This is a dilemma that a lot of us have when we go on our summer vacation. I am going to put my trust in my young friend, Nick Carlson, someone I have known since he was in the third grade. These tomatoes are very important. I always experiment with different heirloom varieties. Some work, some don’t. Every year brings different results. I keep trying to weed through the process of why some work and others fail. There is weather, varieties and cultural needs. What works in Santa Barbara? I am trying to figure it out. I do know that there are good years and bad years. Sometimes it is not the plants fault. You have got to keep trying. Just because Hillbilly did not work last year, does not mean that it won’t be great this year. Keep trying. Example: Three years ago my Hillbilly was good. Last year I only got three off of a sad looking bush. This year I have over 20 tomatoes ( and they are usually a pound each) on one plant. Oh yeah!!! Keep on trying!!! 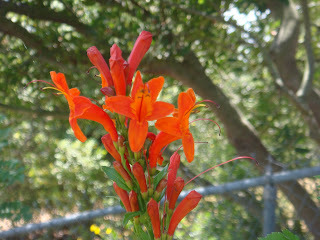 I didn’t think we needed to see any more pictures of the Gap fire but I did include a picture of flame colored flowers. 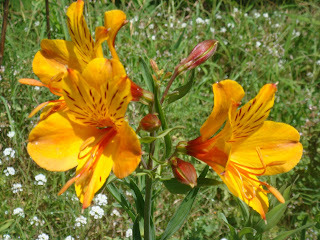 This is a picture of my Rothschild Lily climbing through my Marmalade Bush. The news from the fire seems better for Goleta today. It was quite a scare. Just about everyone should be home soon. They lifted my evacuation order Saturday afternoon so I was able to water my garden. I was relieved that the Carmello tomatoes I started in pots for the Tomato Tasting did just fine. I normally water my containers on Fridays, but everything is o.k except for the ashes. After you get your walkways and house clear of ashes it is time to hose off your plants. They will really appreciate it. Wildfire prevention and preparedness is on our minds this week. We all want to reduce or prevent wildfire damage to our homes and property. We have good resources for information available to us. The city of Santa Barbara has a Firescape demonstration Garden at 2411 Stanwood drive on the corner of Stanwood drive and Mission Ridge Rd. It’s open daily with free admission. 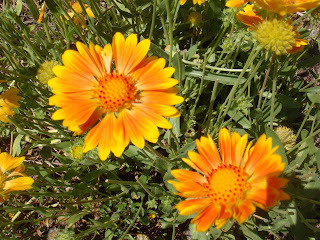 Santa Barbara County Fire department department has a great plant reference guide at http://www.sbcfire.com. The entire site is a valuable. For plant list hit Fire Prevention and Plant Reference Guide. The pace has slowed down a bit here at the nursery. The spring push to get the gardens remodeled with a fresh look and the vegetables planted (to hopefully cut our grocery costs) are now over. Now we are just trying to keep everything watered and healthy. 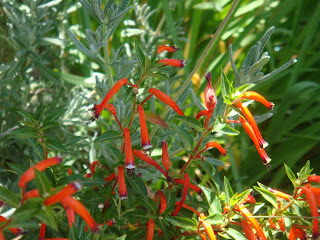 In the nursery, we are still fully supplied with all the summer, heat-loving color. Black-eyed Susan, purple coneflower and of course the ever popular, petunias, marigolds and zinnias. Most all the landscaping shrubs and hardy perennials are looking good and still very available. If you have a hillside or erosion control problem-NOW is the time to plant it up. Don’t wait until the winter rains come. Get the young plants started now. Give the roots time to grow strong and root in. And of course, don’t forget the roses. We still have hundreds to choose from and they can be planted anytime all summer long. Remember to keep deadheading and feeding every six weeks for best performance. If bugs or disease are a problem, bring in samples. We will try to give you the most organic and safe solution to the problem. Don’t forget that our rose field is closed every Wednesday for maintenance. In the vegetable garden, there is still plenty of time to plant tomatoes, squash, beans, eggplant, peppers and herbs. I just planted more tomatoes and cucumbers, this weekend. You can continue to plant new crops of lettuce every few weeks. Maybe giving them afternoon shade as the summer gets warmer. Right now the emphasis is on feeding, mulching and maintenance. Watching out for bugs and disease. 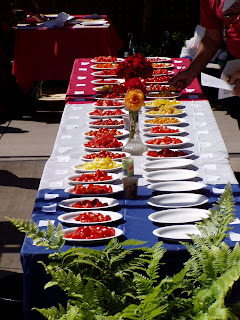 Our annual Tomato Tasting Experience will be Sunday September 7 from 12 to 2. That’s in almost 100 days. Why am I telling you now? I am telling you now because you still have time to put in tomatoes to enter our contests. You even have time to grow tomatoes from seed. Everyone is always in such a hurry to plant tomatoes in the spring. We start getting calls in January! A little known secret is that June tomatoes are often times more successful than March tomatoes. In June the days are long and the soil is warm. I try to plant a few tomatoes every month from March until September. In September I put in the “cool season” tomatoes. Normally no matter when I plant I get my first ripe tomatoes around the 4th of July. This year I planted the cool season Stupice in April and it’s ready now. I will remember to plant more next spring. We are growing tomatoes for the tasting at the growing grounds. We have over 40 kinds. Armando is having to guard the seedlings from squirrels. They are a big problem this year. 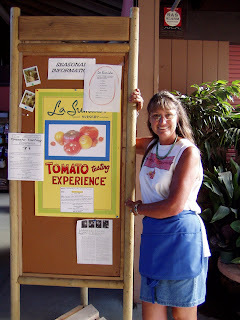 Judi and I are growing tomatoes in our gardens to bring as well. We are focusing on heirlooms. Judi is growing the larger varieties and I am growing the smaller ones. Hopefully Steve Goto will bring a lot in as well. One year we had almost 100 kinds. My stomach didn’t feel too well afterwards but maybe that was from the chile peppers Steve brought for the chile tasting. 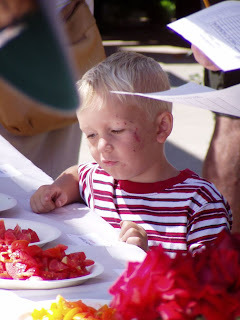 The tomato tasting is a lot of fun. We line up the tomatoes and you rate them for us. It’s great to see the results of everyone’s favorites and helps us to choose what to plant next year. We also encourage every one to bring in their tomatoes as well. We have prizes in different categories such as largest, smallest, most colorful, weirdest looking and most perfect looking. Mark your calendars and plant some tomatoes. Hope to see you there! A lot of you folks already have your vegetable gardens planted for the summer. I got mine started about four weeks ago and it’s coming on strong. For those of you who feel like you might be getting a late start-don’t worry! You still have plenty of time. We will be carrying most all of the summer veggies through August. Its actually better to wait. In March and April, even though the days can be warm and sunny, the nights are still cool. Plants like, eggplant, cucumbers and peppers, will not do well. Most people start to early and try to put in everything all at once. This can lead to disease and loss of vigor for your vegetables. It is much wiser to start off slow and easy with cooler season crops, like herbs, lettuce, onions, chard, spinach and cool season tomatoes. Then as the spring evenings warm up, you can add the squash, cukes and longer season tomatoes. Your garden will catch up and most of the time even pass earlier planted ones. We never know what our spring weather is going to be like. And even though it has been as ideal as we could expect, I am beginning to see customers bringing in samples of problems from early planted tomatoes. Bacterial speck, alternaria, and early blight are diseases with very similar symptoms. It starts off as splatters of rusty brown spots on the leaves. The leaves may start turning yellow. They usually affect the lower and older growth first. Each disorder has its own special look. The cause can range from leaving last years debris, (leaving spores) in the soil, moisture in the air, from foggy and dewy Santa Barbara mornings or overhead watering. Also heavy soils that stay wet and don’t drain well. If this sounds like a problem you might be having, adjust your watering. Once a week should be adequate with proper mulching. You can also pick off the worst leaves and spray with a copper or sulfur spray or other organic fungicides. The next problem I expect to see is blossom end rot. The dark spot that shows up at the bottom end of the tomato. While sometimes it can be caused by the lack of calcium in the soil, the most common reason is uneven soil moisture. Allowing the tomato to dry out to much, then soaking it. Dry-wet, dry-wet. This is mostly a problem for container grown tomato plants. It is best if you can keep the soil evenly moist. Hopefully we won’t see to many bug and disease problems this summer. But if you have any questions, please feel free to contact us or bring in samples. We will be glad to help you find an organic and healthy solution to your problem.